This blog is a compendium of music writing by Jim Hickson throughout the years. I put stuff up here about a month after original publication. First published in the WOMEX – World Music Expo 2018 delegate guide. To become a pioneer in one musical stream requires immense dedication, determination and, of course, prodigious skill and creativity. To become such a leader in more than one stream must truly signal that there is some intense genius at work – genius that the Kronos Quartet possess in abundance. They have gone through some line-up changes over the years, but Kronos Quartet as we now know them comprise David Harrington (violin), John Sherba (violin), Hank Dutt (viola), and Sunny Yang (cello). You may recognise that set-up as a string quartet, a mainstay in the Western classical tradition for over 250 years, but Kronos are anything but stuck in the past. Throughout their history, they have always been new; impressive for a group that have been going for more than 40 years. Founded in 1973 under the intoxicating influence of Crumb’s terrifying avant-garde piece ‘Black Angels,’ Kronos have never quite been your usual quartet. They were a breath of fresh air in the often all-too stuffy world of classical music. Working with composers of cutting-edge contemporary sound art as well as revisiting the old masters, they were the very vision of counterculture where previously there was only orthodoxy. Their artistry was second-to-none and the music was of utmost importance in everything they did. They didn’t do anything that wasn’t complementary to the music, even if that meant rethinking what a string quartet looked like: if the music suited leather jackets better than evening dresses, then so be it. All very groundbreaking, yes, but what do they have to do with WOMEX? Well, as it turns out, everything. They treat all music with the same passionate fervour and deep respect that other string ensembles would usually reserve for classical music. And that really is all music. It doesn’t matter if they’re sitting down to play Hildegard von Bingen or Harry Partch, Geeshie Wiley or Alim Qasimov, Konono No. 1 or DJ Spooky; Kronos’ music spans a thousand years and six continents. The interpretation of worldwide music is not a new thing in Western art music, but the way Kronos approach their musical adventures is revolutionary. They do not treat Western art music as immutable or unmovable. The usual balance is flipped: instead of fitting musics of other cultures into their own frame of reference, they mould their way of playing around the music itself. Collaboration for Kronos goes beyond performing with other musicians. It also extends to the lifeblood of our art: new music. It’s no exaggeration to say that they’re ultimately responsible for the creation of a whole new string quartet repertoire. Over 900 pieces have been composed especially for them, and one of their latest (and most ambitious) projects aims to take this even further. Over five years, Kronos have used their ‘50 For The Future’ project to commission 50 composers from around the world (25 male and 25 female) to each create a totally new piece of music for string quartet. All of the resulting pieces are then made freely available as recordings and scores for anyone to access via their website, opening up a wide range of potentially canon-upsetting music to flourish on the scene and encourage the next bright young string things. The sheer scope and impact of this quartet’s work is impossible to condense into just a few pages of text. It would take listening to their 60+ albums, and even that would barely scratch the surface. So it is for their tireless efforts in the pursuit of the new; for bringing international music of all styles new audiences, new works and new outlooks; and for their stature as the most important string quartet of their generation, it is with delight that we award the WOMEX 18 Artist Award to the Kronos Quartet. 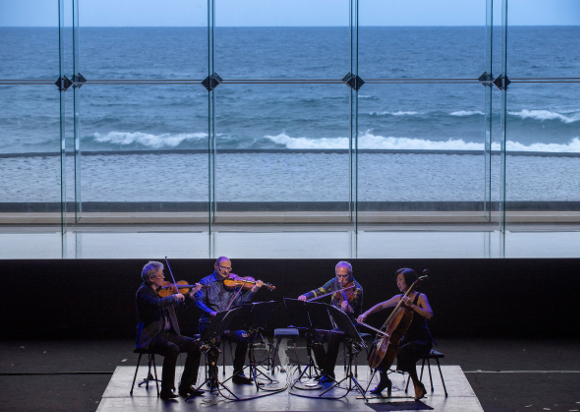 Photo: Kronos Quartet perform at WOMEX 18, by Yannis Psathas. All writing © Jim Hickson unless otherwise stated. Background design by Lizzie Morgan. Simple theme. Powered by Blogger.